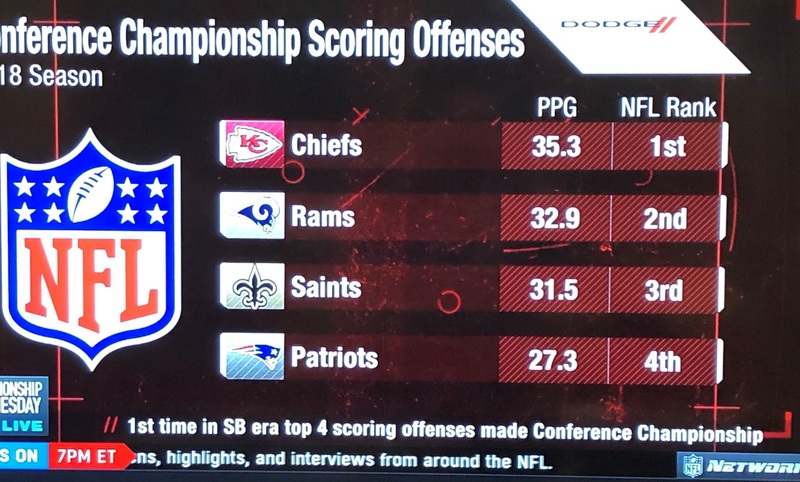 All four teams boast a dynamic offence and for the first time the top 4 scoring offensive teams make the Conference Championship Games. Predictions of 35-27 and 33-32 scores ? The NFC games last weekend were both low scoring affairs and the Rams managed to account for the Dallas Cowboys with a power running show by running back C J Anderson, who the Rams only picked up in week 14 after his release from the Panthers. Even Quarterback Jared Goff got into the rushing game. Here they come into the New Orleans Saints dome which will be loud and frenzied,. The Saints got past the Eagles last weekend after being in a 14-0 hole however their dynamic running back duo of Alvin Kamara and Mark Ingram got them back on track. Earlier this season the Rams lost in a shootout at New Orleans 45-35 (see offence again). With the stakes so high the defence side of the game will probably kick in. The key here is Saints quarterback Drew Brees. A MVP candidate for this season, he’s playing at the most consistent he ever has and at home he knows every blade of artificial grass. The Saints are a standard 3.5 point home favourite – and so they should be. This will be their natural habitat and noisy. The Saints should win this – the spread is right – they may win by slightly more. Both AFC divisional games last weeks were blow outs. The Colts turned up at Kansas City, were physically man handled and could not get anything out of their offence. The Chargers were embarrassed at New England and totally out coached. Now the Patriots come to the Chiefs in the unusual position as underdogs. Don’t worry – the Chiefs are not acting as favourites either. They know that the Patriots game plan will be something they have probably not seen or be able to prepare for. Chiefs Head Coach Andy Reid has a chance here to go to his second Superbowl – the first one he went to in 2005 he lost to – yes to Bill Belichick and the Patriots. Here the Patriots have a chance go to their 11th. The Chiefs last went to – and won it in 1970. The weather is being talked as a factor – a high of 20 Fahrenheit (that’s -6 in Celsius) however that will not affect either team regardless of what predictions are saying in terms of favouring the Chiefs. Oh and this season when these teams met the Patriots won 43-40. A common theme again. Next story How The West Was Won: How the Axis of Power Shifted In World Cricket.